Optical media, such as CDs, DVDs and Blu-ray discs can play a valuable part of a secure image storage strategy. This lesson outlines the best way to use optical disc, including how to store and care for the discs. CD, DVD, and Blu-ray discs provide a cost-effective and forward-compatible way to back up or transfer your images. Because so much content (music and movies) is distributed in this format, it is likely that players for these discs will be available long into the future—hopefully long past the time when you have migrated your backup storage to some other medium. While the capability to play optical discs will be available long into the future, the particular discs you burn today may not be so lucky. Data stored on an optical disc can degrade at an unknown rate, leaving you with discs that are partially or totally unreadable. There is a lot of conjecture and bad information floating around about the longevity of optical discs, but the truth is that we do not know how long any particular one will last. With proper handling, a quality optical disc that is burned well should be a valuable backup to a hard drive–based archive for 5 to 10 years. I have done data validation experiments on the DVDs, and have found little evidence of data degradation on properly stored discs. Because of their small storage capacity (682 MB), CDs only make sense for photographers who shoot JPEGs rather than raw files. Manufacturing defects and poor storage conditions can result in data loss. Gold foil CDs are considered to be the best quality. Rewritable discs are inherently less stable than write-once discs. DVD can be a very good option for backups at the present time, depending on how much data you create. DVDs are relatively stable, hold large amounts of data (4.3 GB), and should be readable for quite some time to come. 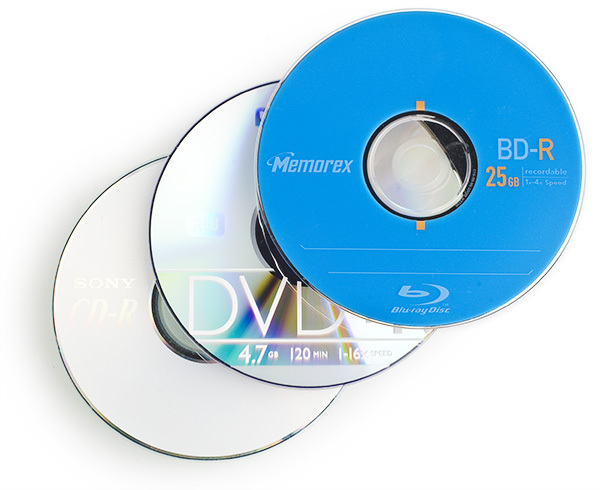 The DVD+R format is more modern than DVD-R and includes some newer error-correction technology, and is therefore a better choice for archive discs. Manufacturing defects and poor storage conditions can result in data loss. Two brands of DVD that are considered particularly stable are Delkin Gold and Taiyo Yuden. In early 2008, the format war between Blu-ray and HD-DVD ended, with Blu-ray victorious. Blu-ray discs are the same physical size as CDs and DVDs, but hold either 23 or 46 gigabytes. Blu-ray players and recorders should always be able to play or record CD and DVD media. Recent changes in disc manufacturing technology should result in Blu-ray discs selling for roughly the same price as DVD blanks, once production gets up to speed. When you buy discs in bulk, they are often packaged in cakeboxes. These are a very efficient from a space perspective, but offer little protection to the discs themselves. Not only are the discs subject to scratching due to foreign matter that might get between the discs, but any time you actually need to find a disc, you will run the risk of scratching the discs you are looking through. Cakeboxes should not be used for any discs that you will count on for long-term access. There is a reason discs come in Jewel cases. This is the safest way to store a disc. The disc surface (both top and bottom) is suspended so that nothing touches it. Of course, Jewel cases make a backup archive take up significantly more room than notebooks do. Instead of a spot on a shelf, you need a piece of furniture. 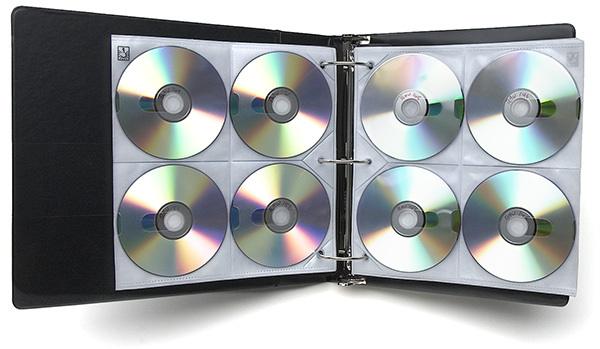 If you have both the space available, and the paranoia, Jewel cases are the most secure. Note that you should not pull a disc up from the sides to remove it from a jewel case, since flexing the disc can damage it. Press down on the center section to release the disc instead. Jewel cases that do not have a center-release mechanism are not good candidates for long-term storage. Write-once discs are the only kinds of discs to use for long-term backup. With write-once discs, it is possible to know that all the data written to the disc is still available, down to the last bit. There is a complete write-up, including movies, in the class trademark™ Data Validation section.